UNDP Report 2013 in the two page summary overview started the first sentence on the first indicator: ‘The world reached the poverty reduction target five years ahead of schedule.’ The first row of the Gaptimer MDG Progress Chart also shows that the 2015 poverty reduction targets have already been achieved even earlier in three world regions (also China was an excellent performer with time lead of even 13 years, reaching the 2015 target in 2002). This is an update of the publication in The Guardian by Professor Pavle Sicherl based on the older data from the 2012 MDG report and reported ealier on this web page. Monitoring implementation with time distance deviation is like comparing train or bus arrivals with the respective timetables. In the context of the MDGs, it amounts to comparing the time of actual implementation with the time stipulated by the schedule to the 2015 target. We are therefore measuring the gap in time. In general the Gaptimer MDG Progress Chart presents in a single table at a glance results for 100 cases across 10 MDG indicators and 10 units (7 world regions, Developing Regions, China, and India) expressed in time lead or time lag providing stories of the situation from the novel time perspective. There are many green colour fields indicating cases where targets have been reached or indicators are ahead of the line to target, to show the many positive developments in the developing countries. The situation differs among the world regions, but the overall situation shows that the number of cases ahead of the line to target (21+15) is exceeding the number of cases behind (18+14). In absolute terms progress has been made in all selected indicators and in all world regions (though it has been quite uneven across regions as well as across countries within the regions). Furthermore, for countries with delays the application of the overall MDG targets at the regional and national cases may be unrealistic. 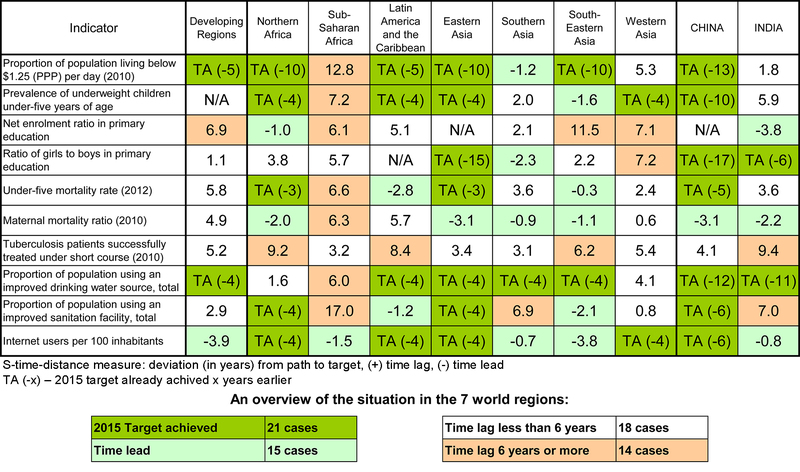 For more detailed analysis, below we provide Excel files of results of time distances in which time lead or time lag from the line to the respective MDG 2015 targets are shown for 112-137 developing countries respectively for the five selected indicators. This monitoring method can be applied much more widely. Firstly, world regions can be exchanged with countries, regions within countries, or socio-economic groups, sectors, etc. Secondly, units could be products of an enterprise, budget activities or operational projects, etc., and with e.g. relevant KPIs as horizontal entries.